15th day of the 2nd lunar month of 1624: Saruwaka Kanzaburô obtained a licence issued by the Shogounal authorities, granting him with the right to produce theater shows. The theater was built in the district of Nakahashi, at the current location of the Maruzen Department Store (Nihonbashi). 3rd lunar month of 1624: first performance at the Saruwakaza. 4th lunar month of 1632: Saruwaka Kanzaburô received the order to move his theater. He moved to the district of Negi-chô (corresponding grosso modo to the current district of Ningyô-chô). 29th day of the 1st lunar month of 1641: both the Murayamaza and the Nakamuraza were burnt in a big fire. 5th lunar month of 1651: Nakamura Kanzaburô I received one more time the order to move his theater. He moved to the district of Sakai-chô. 18th day of the 1st lunar month of 1657: a fire broke out in the Honmyôji temple in the district of Hongô and devastated Edo. All the Kabuki theaters were destroyed by the flames. This fire was nicknamed "furisode kaji" (the "long-sleeve fire"). 9th day of the 6th lunar month of 1658: the zamoto Nakamura Kanzaburô I (1598~1658) died. 14th day of the 1st lunar month of 1660: a fire broke out in the district of Yushima. It spread and burnt the Ichimuraza, the Nakamuraza and the newly-constructed Moritaza. 28th day of the 10th lunar month of 1661: both the Ichimuraza and the Nakamuraza were burnt in a big fire. 10th lunar month of 1670: the number of Kabuki theaters in the city of Edo was set to 4 by the authorities. The authorized theaters were the Nakamuraza (in the district of Sakai-chô), the Ichimura-Takenojôza (Fukiya-chô), Moritaza (Kobiki-chô) and the Yamamuraza (Kobiki-chô). 26th day of the 8th lunar month of 1674: the zamoto Nakamura Kanzaburô II (1647~1674) died. 26th day of the 12th lunar month of 1676: a fire broke out in the district of Hama-chô. It spread and burnt both the Ichimuraza and the Nakamuraza. 11th day of the 8th lunar month of 1678: the zamoto Nakamura Kanzaburô III (1649~1678) died. 29th day of the 5th lunar month of 1679: a fire broke out in the puppets theater Ôsaka Shichidayûza in the district of Sakai-chô. It spread and burnt both the Ichimuraza and the Nakamuraza. 28th day of the 12th lunar month of 1682: a fire started by Yaoya Oshichi broke out in the Daienji Temple in the district of Komagome. It spread and burnt both the Ichimuraza and the Nakamuraza. This fire was nicknamed "Oshichi Kaji" (the "Oshichi fire"). 16th day of the 12th lunar month of 1683: a fire broke out in the Nakamuraza in the district of Sakai-chô. It spread and burnt also the Ichimuraza. 3rd lunar month of 1684: the star Ichikawa Danjûrô I played for the first time the role of the wicked priest Narukami in the drama "Kadomatsu Shitennô", which was staged at the Nakamuraza. He was the author of the play and his stage partner in the role of Princess Taema was the onnagata actor Itô Kodayû II. 11th lunar month of 1696: premiere at the Nakamuraza of the first version of "Onna Narukami", which was entitled "Neko no Koneko"; it starred Ogino Sawanojô in the role of the nun Narukami. Others actors were Ichikawa Danjûrô I, Sodeoka Masanosuke II, Nakamura Shichisaburô I, Nakamura Denkurô I, Nakajima Kanzaemon I, Ôtani Hiroemon I and Murayama Jûheiji I. 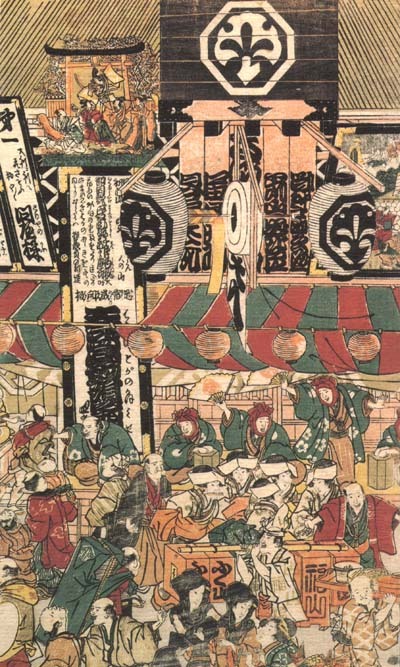 1st lunar month of 1697: premiere of the bombastic "Shibaraku" scene (Kabuki Jûhachiban), at the Nakamuraza, performed within the drama "Daifukuchô Sankai Nagoya". Ichikawa Danjûrô I played the role of the superhero and his stage partners were the onnagata Ogino Sawanojô and the katakiyaku Yamanaka Heikurô I. 10th day of the 12th lunar month of 1698: a fire broke out in the district of Nihonbashi Hongoku-chô. It spread and burnt both the Ichimuraza and the Nakamuraza. 1st lunar month of 1701: premiere at the Nakamuraza of the bombastic play "Zôhiki" (Kabuki Jûhachiban), included in the drama "Keisei Ôshôkun". The hero and the villain were played by Ichikawa Danjûrô I and Yamanaka Heikurô I. 29 november 1703: an earthquake hit Edo and the resulting fires destroyed the city. The 4 main theaters, the Nakamuraza, the Ichimuraza, the Moritaza and the Yamamuraza, were burnt to ashes. This catastrophe was nicknamed "Genroku Jishin Kaji" ("Genroku Earthquake and Fire"). 14th day of the 1st lunar month of 1706: a fire broke out in the district of Kanda Renjaku-chô. It spread and burnt both the Ichimuraza and the Nakamuraza. 20th day of the 11th lunar month of 1706: a fire broke out in the district of Izumi-chô. It spread and burnt both the Ichimuraza and the Nakamuraza. 8th day of the 3rd lunar month of 1707: a fire broke out in the district of Kodenma-chô. It spread and burnt both the Ichimuraza and the Nakamuraza. 1st lunar month of 1709: the 4 Edo theaters, the Nakamuraza, the Ichimuraza, the Moritaza and the Yamamuraza, produced simultaneously a sogamono new year drama. This was the beginning of a custom which is still somehow observed nowadays. 3rd lunar month of 1710: Tsuuchi Jihê II worked at the Nakamuraza on the revival of the seigen-sakurahimemono "Isshin Niga Byakudô", which was staged for the first time in the 7th lunar month of 1695 at the Yamamuraza. The roles of Seigen and Princess Sakura were played by Nakajima Kanzaemon I and Tsutsui Kichijûrô I. For the first time, Tsuuchi Jihê II mixed jidaimono and sewamono elements in the same drama. This was the first jidai-sewamono in Kabuki history. 18th day of the 12th lunar month of 1710: a fire broke out in the somptuous palace of the daimyô Sanada, located in the district of Kanda Koyanagi-chô. It spread and destroyed both the Nakamuraza and the Ichimuraza. 23rd day of the 2nd lunar month of 1712: a fire broke out in the district of Horie-Chô. It spread and destroyed both the Nakamuraza and the Ichimuraza. 22nd day of the 12th lunar month of 1713: a fire broke out in the district of Shitaya Byôbusaka and spread to others sections of Edo, destroying both the Ichimuraza and the Nakamuraza. 11th day of the 1st lunar month of 1716: a fire broke out in the district of Shitaya Ike-no-Hata and spread to others sections of Edo, destroying both the Ichimuraza and the Nakamuraza. 22nd day of the 1st lunar month of 1717: a fire broke out in the district of Koishikawa and spread to others sections of Edo, destroying both the Ichimuraza and the Nakamuraza. 1st lunar month of 1719: Chikamatsu Monzaemon's play "Sonezaki Shinjû" was performed for the first time at the Nakamuraza, starring Ichikawa Danjûrô II and Sanogawa Mangiku in the roles of Hiranoya Tokubê and the courtesan Ohatsu (Tokubê's lover). 1st lunar month of 1720: first Kabuki adaptation of Chikamatsu Monzaemon's puppet theater shinjûmono "Shinjû Kasane Izutsu", which was written in 1707. The same play was simultaneously produced in the 3 Edo theaters and commemorated the 16th anniversary (17th memorial service) of the suicide of the couple Tokubê and Ofusa, whose roles were played by Ôtani Hiroji I and Sanogawa Mangiku at the Nakamuraza. 13th day of the 1st lunar month of 1720: a fire broke out in the district of Sakai-chô; the Nakamuraza was half-burnt. 10th day of the 12th lunar month of 1721: a fire broke out in the district of Kanda Tominaga-chô and spread to others sections of Edo, destroying the Nakamuraza and the Ichimuraza. 27th day of the 11th lunar month of 1726: a fire broke out in the shibai jaya Maruya, located in the district of Fukiya-chô, and spread to others sections of Edo, destroying both the Ichimuraza and the Nakamuraza. 3rd lunar month of 1731: Segawa Kikunojô I played at the Nakamuraza the leading role of the first dôjôjimono of Kabuki history, called "Mugen no Kane Shindôjôji". 11th lunar month of 1740: Ichikawa Danzaburô II and Tomizawa Tatsunosuke took the respective names of Ichikawa Danzô III and Tomizawa Tatsujûrô at the Nakamuraza, performing in the kaomise drama "Miya Bashira Taiheiki". 7~9th day of the 8th lunar month of 1742: a violent typhoon hit Edo, causing floods in the city; the Ichimuraza and the Nakamuraza had to stop their performances for a while. 2nd lunar month of 1744: premiere at the Nakamuraza of the Nagauta-based dôjôjimono "Momo Chidori Musume Dôjôji". The leading female role was played by Segawa Kikunojô I and his two stage partners were Ichikawa Ebizô II and Ôtani Hiroji I.
February (end of month) 1746: a fire broke out in the district of Tsukiji, in the mansion of Tsubouchi Gonzaemon. It spread and destroyed the Nakamuraza, the Ichimuraza and the Moritaza. 8th lunar month of 1750: Nakamura Kanzaburô VI and his son Nakamura Akashi III respectively took the names of Nakamura Kankurô II and Nakamura Kanzaburô VII. Nakamura Kankurô II was no more the official head of the Nakamuraza but he unofficially kept on working as a zamoto up to 1751. 3rd ~ 6th lunar months of 1753: the Kamigata star Nakamura Tomijûrô I achieved a huge success for several months by playing the main role of the dance "Kyôganoko Musume Dôjôji", which was performed for the first time in Kabuki history, at the Nakamuraza [print]. 3rd lunar month of 1754: premiere at the Nakamuraza of the dance "Hanabusa Shûjaku no Shishi"; the leading role of this dance was played by Nakamura Tomijûrô I. 11th lunar month of 1754: great shûmei at the Nakamuraza; Matsumoto Kôshirô II and Matsumoto Kôzô respectively took the names of Ichikawa Danjûrô IV and Matsumoto Kôshirô III during the kaomise program "Miura no Ôsuke Bumon no Kotobuki". 14th day of the 1st lunar month of 1756: a fire broke out in the district of Shinzaimoku-chô. It spread and destroyed both the Ichimuraza and the Nakamuraza. 2nd lunar month of 1760: a fire broke out in the district of Kanda and spread to Susaki in the district of Fukagawa. It destroyed both the Ichimuraza and the Nakamuraza. It was called "Akashiya no Kaji" ("the Akashiya fire"), based on the name of the shop where it started. 17th day of the 9th lunar month of 1761: a fire broke out in the Gekiza theater. It destroyed the Ichimuraza and damaged the Nakamuraza. 29th day of the 2nd lunar month of 1766: a fire broke out in the district of Sakai-chô, in the cosmetics shop owned and managed by the actor Onoe Kikugorô I. It destroyed both the Ichimuraza and the Nakamuraza. This fire was nicknamed "Kikugorô Aburamise Kaji" ("Kikugorô's cosmetics shop fire"). 1st lunar month of 1771: Matsumoto Kôshirô II achieved a great success at the Nakamuraza by playing the deity Aizen Myôô and the seven roles of Kagekiyo in the new year drama "Sakaichô Soga no Nendaiki". 3rd lunar month of 1775: premiere at the Nakamuraza of Kawatake Shinshichi I's Tokiwazu-based dance-drama "Shinobu-gusa Koi no Utsushie", in which Nakamura Nakazô I played the role of the woman selling shinobu, in reality the evil monk Dainichibô. "Nakazô wanted to dance "Musume Dôjôji" (Maiden at Dôjôji), the story of a young woman's consuming, unrequited passion for a young monk of the temple Dôjôji, but this was the special preserve of the two [..] female impersonators, Kikunojô I and Tomijûrô I. So the playwright Kawatake Shinshichi devised an ingenious alternative version of "Dôjôji", in which the evil monk Dainichibô appeared disguised as a woman selling hare's-foot fern (shinobu), and Nakazô I first performed the Shinobu Uri (Seller of the Hare's-foot Fern), including a dance sequence, to great acclaim at the New Year of 1775" (from "The Actor's Image"). 11th lunar month of 1778: Yoshizawa Sakinosuke III took the name of Yoshizawa Ayame IV at the Nakamuraza, playing the role of Onoe in the kaomise drama "Motomishi Yuki Sakae Hachinoki". 28th day of the 10th lunar month of 1783: a fire broke out in Edo in the district of Kodenma-chô, which spread and burns the Nakamuraza. Fall 1793: the Nakamuraza went out of business and gave its license to the Miyakoza. 11th lunar month of 1797: the Nakamuraza reopened. 4th day of the 11th lunar month of 1802: a fire broke out in Edo in the district of Naniwa-chô and destroyed both the Ichimuraza and the Nakamuraza. 13th day of the 11th lunar month of 1806: a fire broke out from the shop of the hair-dresser Tomokurô in the district of Nihonbashi Fukiya-chô. It spread and burnt both the Ichimuraza and the Nakamuraza, killing many spectators. 11th lunar month of 1807: grand shûmei for the Hamamuraya guild, at the Nakamuraza, where Segawa Rokô III and Segawa Michinosuke respectively took the names of Segawa Senjo and Segawa Rokô IV. They performed together in the kaomise drama "Kaikei Yuki no Konoshita"; their main stage partners were Ichikawa Omezô I, Bandô Hikosaburô III, Arashi Otohachi II and Ôtani Oniji IV. 1st day of the 1st lunar month of 1809: a fire broke out in the district of Nihonbashi Sanai-chô and destroyed both the Ichimuraza and the Nakamuraza. 3rd day of the 5th lunar month of 1810: Nakamura Kanzaburô X, who managed the theater from the 6th lunar month of 1786 to the 4th lunar month of 1787 and ran away because of the debts, died. 3rd lunar month of 1811: premiere at the Nakamuraza of the 7-role Nagauta-based hengemono "Osozakura Teniha no Nana Moji" ; the seven roles were performed by Nakamura Utaemon III. 9th lunar month of 1812: the actor Nakamura Utaemon III, who was about to travel back to his native Kamigata after more than 4 years spent in Edo, performed his onagori kyôgen at the Nakamuraza, which included the premiere of a sanbasô entitled "Mata Kuru Haru Suzuna no Tanemaki". The roles of Sanbasô, Senzai and Okina were performed by Nakamura Utaemon III, Nakamura Akashi IV and Nakamura Shichisaburô IV. 3rd lunar month of 1813: premiere at the Nakamuraza of the 12-role hengemono "Shiki no Nagame Yosete Mitsudaiji" , made up of twelve dances, one for each month of the lunar calendar. All the roles were played by Bandô Mitsugorô III. 29th day of the 11th lunar month of 1813: a fire broke out in the district of Takasago-chô and destroyed both the Ichimuraza and the Nakamuraza. 12th day of the 1st lunar month of 1817: a fire broke out in the district of Norimono-chô and destroyed both the Nakamuraza and the Kiriza. 9th lunar month of 1820: premiere at the Nakamuraza of the 7-role hengemono "Setsugekka Nagori no Bundai". All the seven dances were played by Bandô Mitsugorô III. Three dances ("Asazuma Bune", "Makasho" and "Tama Usagi") are still part of the current Kabuki repertoire. 11th lunar month of 1825: premiere at the Nakamuraza of Tsuruya Nanboku IV's drama "Oniwaka Kongen Butai". The main roles were played by Ichikawa Danjûrô VII, Iwai Shijaku I (Osome) and Iwai Kumesaburô II (Hisamatsu). The michiyuki entitled "Ukine no Tomodori" is still part of the current Kabuki repertoire. 8th day of the 12th lunar month of 1825: a fire broke out in the puppet theater Yûkiza, district of Fukiya-chô, and destroyed both the Nakamuraza and the Ichimuraza. 3rd day of the 1st lunar month of 1827: a fire broke out from the third floor of the Ichimuraza and destroyed the Ichimuraza, the Nakamuraza and 2 puppet theaters. 3rd lunar month of 1828: premiere at the Nakamuraza of the 7-role hengemono "Nijirigaki Nanatsu Iroha", which was performed by Nakamura Shikan II. Two of the roles, "Keisei" and "Tomo Yakko", are still part of the current Kabuki repertoire. 9th lunar month of 1828: premiere at the Nakamuraza of the drama "Nochi no Tsuki Shuen no Shimadai". The main roles were played by Nakamura Shikan II and Segawa Kikunojô V.
21st day of the 3rd lunar month of 1829: a fire broke out from the shop of Owariya Tokuemon, in the district of Kanda Sakuma-chô. It spread and destroyed the Edo theaters district. The Moritaza, the Ichimuraza and the Nakamuraza were burnt to ashes. 4th day of the 8th lunar month of 1829: Nakamura Kanzaburô XI died. Nakamura Denkurô V most likely took the name of Nakamura Kanzaburô XII and became the new official zamoto of the Nakamuraza in the 8th lunar month of 1829 but he kept on performing under the name of Nakamura Denkurô V up to the 8th lunar month of 1830. 3rd lunar month of 1830: premiere at the Nakamuraza of the 9-role hengemono "Minokoshite Haru no Kokonoe"; Nakamura Shikan II played all the roles, including the Yashima Court Lady, which is still part of the current Kabuki repertoire ("Kanjo"). 23rd day of the 12th lunar month of 1830: a fire broke out in the district of Nihonbashi Kodenma-chô. It spread and destroyed the Ichimuraza and the Nakamuraza. 3rd lunar month of 1831: premiere at the Nakamuraza of the five-role hengemono "Rokkasen Sugata no Irodori". It starred Nakamura Shikan II in the five roles of Sôjô Henjô, Ariwara no Narihira, Bun'ya no Yasuhide, Kisen and Ôtomo no Kuronushi. His stage partner in the role of Ono no Komachi was Iwai Kumesaburô II. 11th lunar month of 1832: great shûmei at the Nakamuraza for the Iwai clan; Iwai Hanshirô V, Iwai Kumesaburô II and Iwai Hisajirô II respectively took the names of Iwai Tojaku, Iwai Hanshirô VI and Iwai Kumesaburô III. They played together in Segawa Jokô II's drama "Goban Tadanobu Yuki no Kuroshiro". 7th day of the 2nd lunar month of 1834: a fire broke out in the district of Kanda Sakuma-chô. It spread and destroyed the Ichimuraza and the Nakamuraza. 11th lunar month of 1837: premiere at the Nakamuraza of Sakurada Jisuke III's Tokiwazu-based hengemono "Kube Kiyoi Kumo no Itosuji", which was staged at the end of the kaomise drama "Kanzen Chôaku Tsuwamono no Kao Kagami". It starred Sawamura Tosshô I and Iwai Shijaku I. 3rd lunar month of 1839: premiere at the Nakamuraza of the 8-role hengemono "Hana Goyomi Iro no Showake", which was performed by Nakamura Utaemon IV. One of the role, "Toshima", is still part of the current Kabuki repertoire. Nakamura Komasaburô took the name of Nakamura Fukusuke I during this performance. 7th lunar month of 1841: premiere at the Nakamuraza of the dance "Ame no Gorô", which was performed by Onoe Tamizô II as part of a nine-role hengemono entitled "Yae Kokonoe Hana no Sugatae". 6th day of the 10th lunar month of 1841: a fire broke out from the backstages of the Nakamuraza in the district of Kanda Sakai-chô. It spread and destroyed the Ichimuraza and the Nakamuraza. 20th day of the 10th lunar month of 1841: the Edo authorities forbade the reconstruction of the destroyed theaters in Sakai-chô. 19th day of the 12th lunar month of 1841: the Nakamuraza, Ichimuraza and Kawarasakiza were ordered to move to the remote district of Asakusa Saruwaka-chô. 7th lunar month of 1842: the construction of the new Nakamuraza was completed. 10th lunar month of 1842: opening ceremony for the new Nakamuraza; Nakamura Kanzaburô XII produced the drama "Kinryûzan Chikai no Ishizue" with the actors Iwai Tojaku, Sawamura Tosshô II, Arashi Kichisaburô III, Onoe Eizaburô III, Bandô Hikosaburô IV, Osagawa Tsuneyo IV, Arashi Izaburô II and Ichikawa Danzaburô V.
1843: Nakamura Kanzaburô XII was condemned by the Edo Authorities for falsification of documents related to the number of shibai jaya in his theater. As a punishment, he was handcuffed at home and his theater was temporarily closed (no kaomise in the 11th lunar month). 3rd lunar month of 1844: end of punishment for Nakamura Kanzaburô XII, who had to pay a heavy fine in order to get his handcuffs removed. He produced the drama "Sugata no Hana Yayoi no Kagamiyama", which celebrated the shûmei of Iwai Hanshirô VII, Matsumoto Kôshirô VI and Ichikawa Komazô VII. 1st lunar month of 1845: premiere at the Nakamuraza of Sakurada Jisuke III's dance-drama "Awa Mochi", which was staged under the title "Hana no Hoka Niwaka no Kyokuzuki" in the new year program "Tama Tsubaki Genpei Soga". The roles of the awa mochi makers were played by Nakamura Utaemon IV and Ichikawa Kuzô II. 1st lunar month of 1846: premiere at the Nakamuraza of Sakurada Jisuke III's Tokiwazu-based dance-drama "Kagura Uta Kumoi no Kyokumari", which was commonly called "Dontsuku". The music was written by Kishizawa Shikisa V and it was performed by the Tokiwazu musical ensemble led by Tokiwazu Mojidayû IV. The leading dancer was Nakamura Utaemon IV. Others main dancers were Bandô Shûka I, Ichimura Uzaemon XII and Seki Sanjûrô III. 4th lunar month of 1850: Nakamura Kanzaburô XII gave his name to his son Nakamura Denzô III (who became Nakamura Kanzaburô XIII) and retired, taking the name of Nakamura Kankurô III. 9th lunar month of 1850: premiere at the Nakamuraza of the drama "Minoriyoshi Kogane no Kikuzuki", a revision by Fujimoto Kichibê of the ghost play "Banshû Sarayashiki", which starred Ichikawa Danjûrô VIII, Ichikawa Kodanji IV, Bandô Shûka I and Nakayama Ichizô in the roles of Asayama Tetsuzan, the koshimoto Okiku and Iwabuchi Chûta. 4th lunar month of 1851: premiere at the Nakamuraza of the Tokiwazu-based dance "Kioi Jishi Kabuki no Hanakago", commonly called "Kioi Jishi", starring Ichikawa Kodanji IV, Bandô Takesaburô I, Onoe Kikujirô II and Iwai Kumesaburô III. 11th day of the 10th lunar month of 1851: the actor and zamoto Nakamura Kanzaburô XII (1800~1851) died. 5th day of the 11th lunar month of 1854: a big fire breaks out in the district of Seiten-chô and reduced to ashes the Ichimuraza, the Nakamuraza and the Moritaza. 2nd day of the 10th lunar month of 1855: the Ansei earthquake (Ansei Daijishin) destroyed the Nakamuraza. 22nd 4th lunar month of 1864: a fire broke out in a Moritaza's shibai jaya; it quickly spread and burnt the Moritaza, the Ichimuraza and the Nakamuraza. 1875: Nakamura Kanzaburô XIII retired and entrusted the management of the Nakamuraza to the actor Nakamura Nakazô III. 31 December 1876: a fire broke out in Edo in Asakusa and destroyed both the Satsumaza and the Nakamuraza. 1877: the new zamoto was Hirano Gihei, who rebuilt the theater and renamed it Miyakoza, the name of one of the hikae yagura of the Nakamuraza during the Edo period. July 1878 ~ December 1878: the Miyakoza opened, ran business a few months and quickly went bankrupt. July 1879: the theater reopened under the name of Saruwakaza; his new zamoto was Iwai Kumesaburô IV, the adopted son of Nakamura Kanzaburô XIII's brother-in-law Iwai Hanshirô VIII. 23 January 1882: a fire destroyed the Saruwakaza. June 1882: Nakamura Akashi V, the new manager of the Saruwakaza, who could not rebuild the theater, rented the Shintomiza and produced the dramas "Kawanakajima Azuma Nishikie", "Kiri Kogata Kyô no Benisome" and the dance "Mochizuki". This program welcomed in Tôkyô the Kamigata actor Ichikawa Udanji I. 1883 ~ October 1884: the Saruwakaza was closed. Fall 1884: the theater was rebuilt in the district of Asakusa Torigoe-Chô. 23 January 1885: a fire broke out in the Saruwakaza and reduced it to ashes. June 1886: the theater was rebuilt, renamed Nakamuraza and reopened. Summer 1891: the Nakamuraza went bankrupt. January 1892: the theater reopened and was renamed Torigoeza. 22 January 1893: a fire broke out in the district of Torigoe-chô and reduced to ashes the Torigoeza. The Nakamura clan could not find the money to rebuild it, putting an end to a 269 years long history. "Onna Date" is still part of the current Kabuki repertoire. The 4th role is still part of the current repertoire ("Echigo Jishi"). The role of the Bonito seller is still part of the current Kabuki repertoire ("Katsuo Uri"). One of these roles ("Tobae") is still in the current Kabuki repertoire.